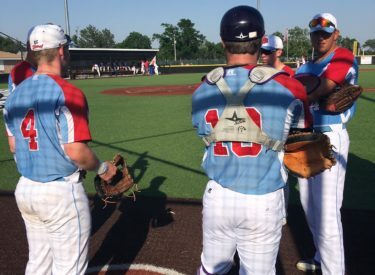 The Liberal Bee Jays built a 6-1 lead in the way to defeating the Hays Larks 6-5 Saturday night at Larks Park in Hays. The series is even at a game a piece. The Bee Jays, who had a 1.56 ERA coming into the game, received excellent starting pitching again. For the second straight night, a BJ starting pitcher worked into the eighth. Sam Beattie worked 7 and 1/3 for the win. Cale O’Donnell closed it out with a perfect ninth for the save. Liberal scored four in the first against the Larks. Nate Crossman singled before Zac Cook laid down a sac bunt and reached on an error. O’Donnell lined an RBI double down the right field line. Garrett Scott singled home a run. Austin Ott doubled to right Center to score a run. Gage Teer grounded out but drove home the run. Hays scored in the fifth to make it 4-1. Liberal made it 5-1 with a run in the sixth. Ott and Teer singled and Brenon Rhodes hit a sacrifice fly to right. The Bee Jays extended the lead to 6-1 when Crossman and O’Donnell singled and Scott hit a sac fly to right. Things got a bit hectic in the eighth when they scored four and had the tying run on third and lead run on second. Chance Carner got out of the mess with a strikeout and ground out. Liberal is 4-3 and Hays is 3-2. The two teams play again Sunday night at 7 on 1270 and kscbnews.net. The 1270 portion of the broadcast will begin after he Royals game.